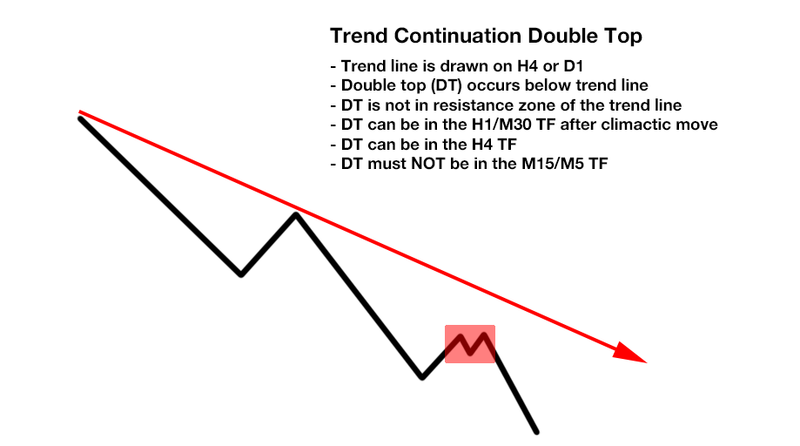 There are 8 different Trend Continuation Double Top/Bottom variations! The first 4 variations are very strong. 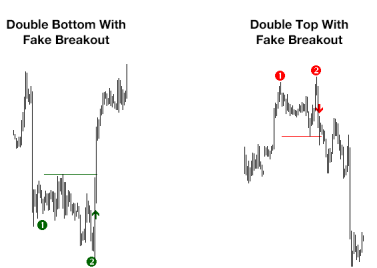 Double tops and bottoms which occur directly at a trend line are one of the best signals you can get. Often enough the price jumps away from the trend line and continues the trend. 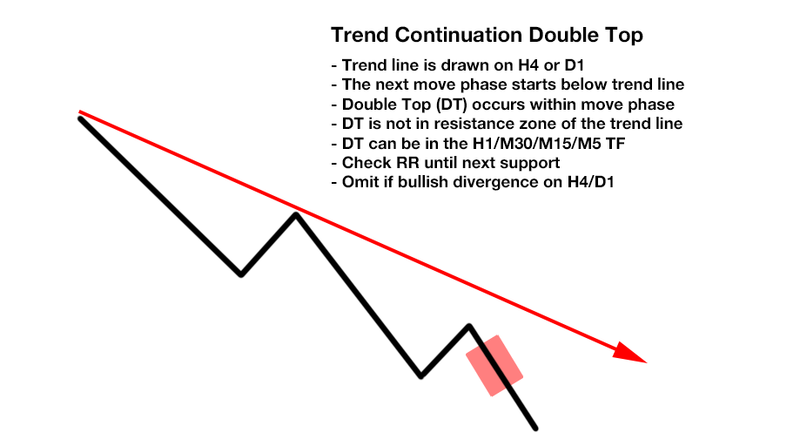 But if you get a double top or bottom directly at the trend line then get an even better edge. You get a very early confirmation that the next move phase of the trend has started. The profit potential is huge because usually the next resistance/support area is far away. And on top you have a very well defined stop area below the lowest low of the double bottom and highest high of the double top. 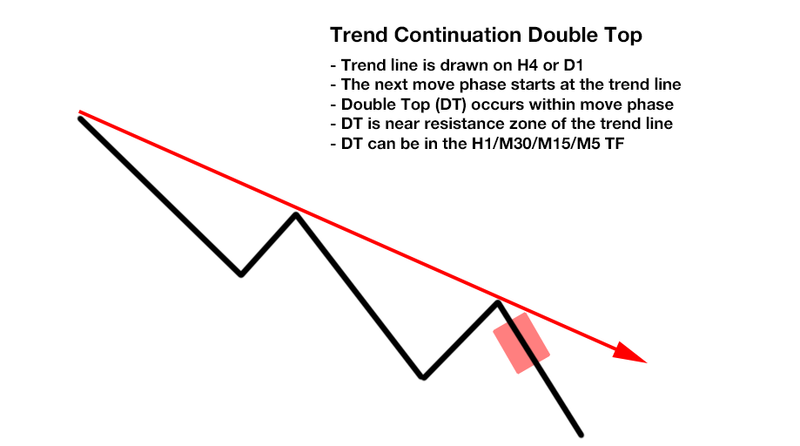 Double tops and bottoms which occur near a trend line after the move phase has begun are also very good setups. The price has touched the trend line which was drawn on D1 or H4 and then jumped away from the trend line. This rejection from the trend line starts the next move phase of the trend. You can visualize the start of the move phase e.g. with the indicator Heiken Ashi. Then you wait for a double top/bottom signal on a lower timeframe M5 to H1. H4 signals will most probably not occur after the move phase has started. The signals have also a huge profit potential because the next resistance/support area is usually far away. The price gets rejected from the trend line to the upside. After the Heiken Ashi of the timeframe H4 turned green then it's an indication that the price moved in direction of the trend. Now that the Heiken Ashi shows a green value you wait for double bottom on H1, M30, M15 and M5. The price gets rejected from the trend line to the downside. After the Heiken Ashi of the timeframe H4 turned red then it's an indication that the price moved in direction of the trend. Now that the Heiken Ashi shows a red value you wait for double top on H1, M30, M15 and M5. Double tops and bottoms which occur far away from the trend line can also represent good setups if there is enough room to the next support/resistance. But you have to be more cautious which signals you trade! 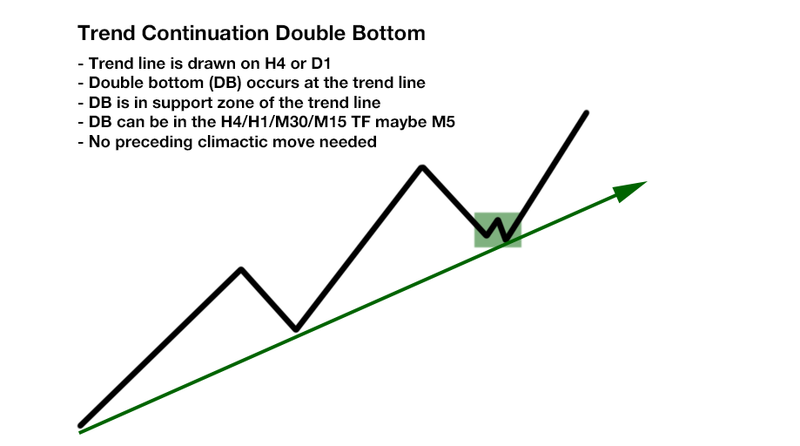 The pullback phase of the upward trend which you see on the timeframes H4/D1 is a downward trend on lower timeframes like M15/M5. With the signals "double tops/bottoms far away from the trend line" you try to catch the reversal of the downward trend. Trends tend to resume. Therefore, the double bottom which stops the downward trend should be very strong. We are therefore less interested in signals in the M5/M15 timeframes. 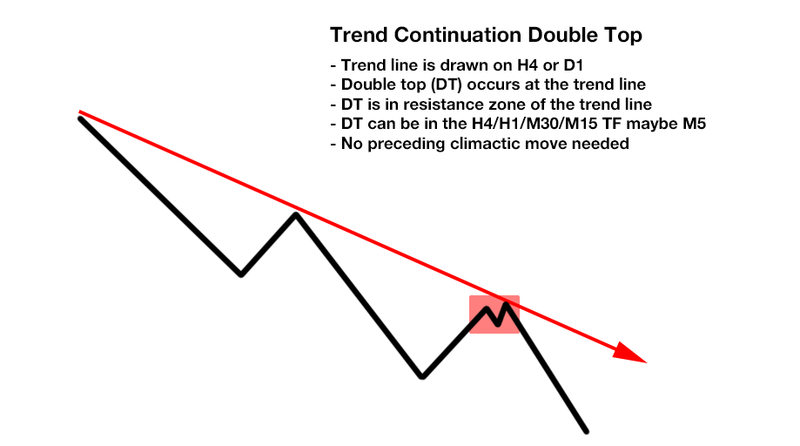 I suggest that even signals in the H1/M30 timeframes should only be trade after a climactic downward move occurred. I will write a separate article about climactic price moves. Double bottoms on H4 are stronger and don't need a preceding climactic downward move. Double tops and bottoms which occur far away from the trend line and during the move phase of the trend can also represent good setups. But you have to check the risk/reward and you need to check for divergences on the higher timeframe! The next move phase of the upward trend has started. This can be indicated with a Heiken Ashi turning green on the timeframe H4. 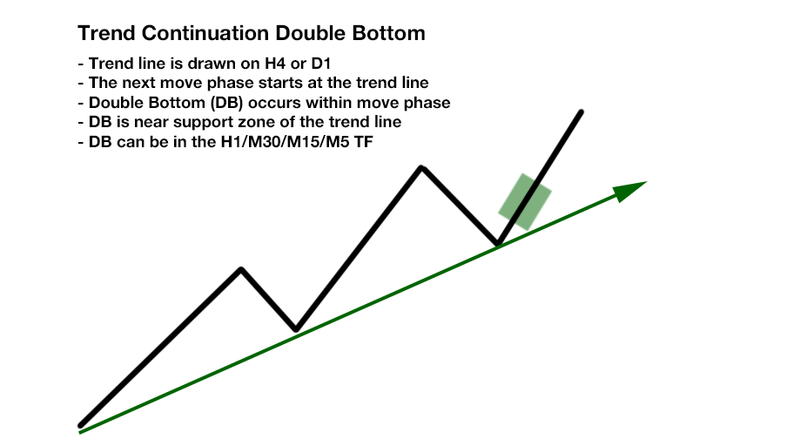 Now you wait for a double bottom signal in the timeframes H1/M30/M15 and M5. 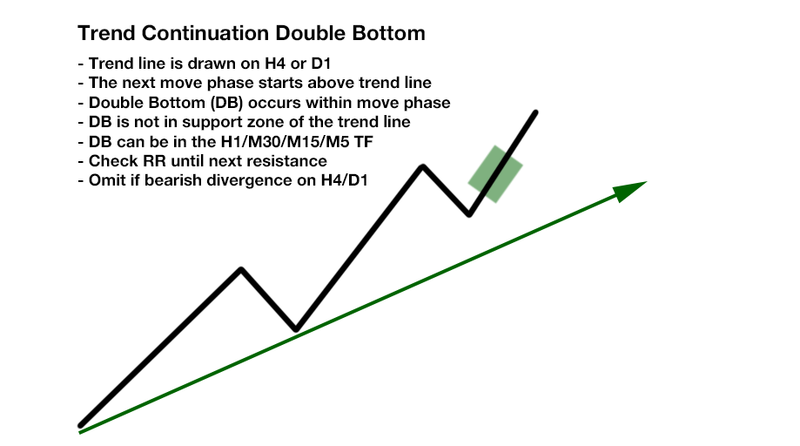 Once you receive a double bottom you need to check the risk/reward until the next resistance zone. 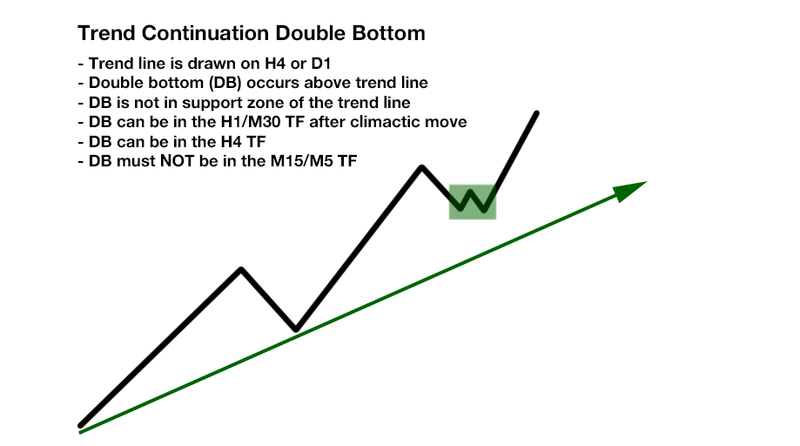 If the risk reward is OK then you should check the timeframes D1/H4 for a bearish divergence visible by comparing the MACD with the price action. Of there is no bearish divergence then you can take the trade. I will write an article about divergences.